'I can't wait to show you my toys.' 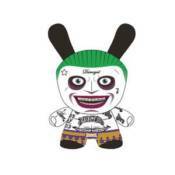 Kidrobot and DC are ready to unveil the new 5' Suicide Squad Joker Dunny. From the hit movie this Dunny features the strong resemblance to the newest iteration of Harley Quinn's Mr. J and will leave you getting the last laugh in your collection!